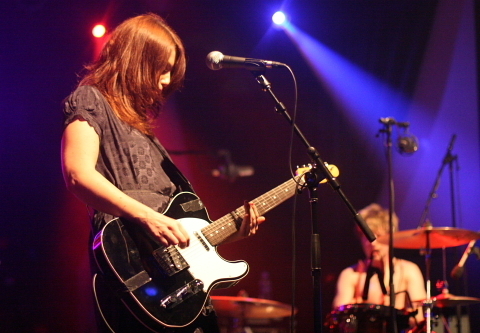 The Rundown: Blood Red Shoes is a two-piece Rock band from Brighton, England, although they consider themselves Punk. Made up of Laura-Mary Carter and Steven Ansell, this duo has released two studio albums with a third in the works. In 2008 they released “Box of Secrets” and in 2010 the released “Fire Like This“. Blood Red Shoes’ influences are Babes in Toyland, Nirvana, Queens of the Stoneage, Pixies, and Sonic Youth. Amazingly, you can hear each influence in almost all of their songs. Blood Red Shoes is a pretty bare-bones band. Steven’s drumset is a 4-piece with just 3 cymbals (I’m assuming the hi-hat is counted as a cymbal). Laura-Mary uses but a simple Telecaster. This band tends to remind me a bit of The Kills in that for just two people, there is an immense amount of sound that comes out of this band. Harmony is a crucial part of this band, as both Laura-Mary and Steven can sing, and sing well. Several of their songs are fantastic, like “Light It Up“, “Heartsink“, and “It’s Getting Boring by the Sea“. One of their best songs is “I Wish I Was Someone Better“. “I Wish I Was Someone Better” is a great rock song. At times it can be almost hypnotic, with the repeated “Oooo, Oooo, Oooo” of Laura-Mary and her repetitive guitar plucking. The song is at times slow, and at other times it is fast paced. The song gains momentum towards the end, with a long snare-drum roll which gives way to a harmony filled outro. Similar to a lot of Punk bands, the guitar parts of many of their songs are quite simple, yet highly effective. Although their American audience isn’t very large due to the fact that they don’t have any albums released in the U.S., they did gain a lot of attention from Americans when they were added to the soundtrack for Scott Pilgrim Vs. the World. MarsBands.com thinks Blood Red Shoes are a fantastic band that you need to know about.